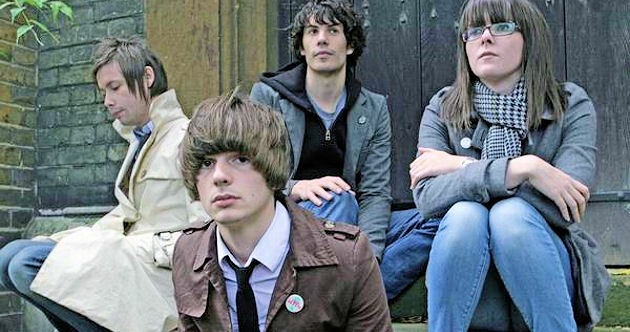 >> Manchester, England-based indie pop wunderkinds The Answering Machine have posted a demo of the new track "Romantic And Square" for free download at its MySpace hacienda. The track doesn't stray too far from the dimensions of the band's prior gems, although the end jams out a bit and the entire track is graced by some sublime melodica. The tune is destined to be a hit, and it is perhaps even stronger than the incalculably catchy "Silent Hotels." We're very excited to hear what The Answering Machine does next, and we think the quartet expects to put another demo online at MySpace sometime this week. We'll save you the trip for now and post "Romantic And Square" below. Fans who've found the band's new message boards will find other fans sharing rarities and radio sessions -- well worth hunting down. The Answering Machine -- "Romantic And Square (Demo)"
>> The web site for German electropop heroes Notwist has been updated with a video clip of the band watching an orchestra track a dynamic and discordant crescendo. It's likely a taste of what is to come on the band's forthcoming set, which is expected for release this spring. Thanks to the Notwist-Ultra blog for the email tip. Notwist is slated to perform May 9 in Berlin, and we just received another half-dozen European dates in an email from City Slang rendered completely in German. Fortunately for us H-Dawg From Accounts Receivable has ninja-like German capabilities. The email had no new album news, but still, if you are in Prague, Steyr, Ljubljana, Zagreb, Graz or Vienna at the end of April, you have reason to be stoked. We reviewed the excellent DVD "On | Off The Record," which memorialized the making of Notwist's superlative 2002 set Neon Golden, right here last February. >> Brooklyn-based cyborg rockers Mobius Band are mounting a seven-week tour of Europe beginning at the end of the month. It's the trio's first jaunt across the pond and they have so many dates booked you'd think they were afraid Europe was going to go out of style. The tour commences in Dublin Feb. 21, culminates in Paris April 7, and between the band will make the sort of irregular but somewhat counterclockwise circuit of continental Europe familiar to backpackers the world over. We're too lazy to post the full slate of dates, but we expect they will make their way onto the band's MySpace yert or the Misra web site sometime soon. Personally we're hoping the lads will be able to report back whether in fact Zurich is indeed stained, as Pavement asserted some 17 years ago. Mobius Band will not be going it alone on their trip, but rather they will be supporting Editors as they did previously in America for a series of dates a couple years ago. More recently Mobius Band convened at drummer Noam Schatz's Western Massachusetts abode for some quick recording, and you can read all about that here. Mobius Band released its sophomore set Heaven oct. 2.